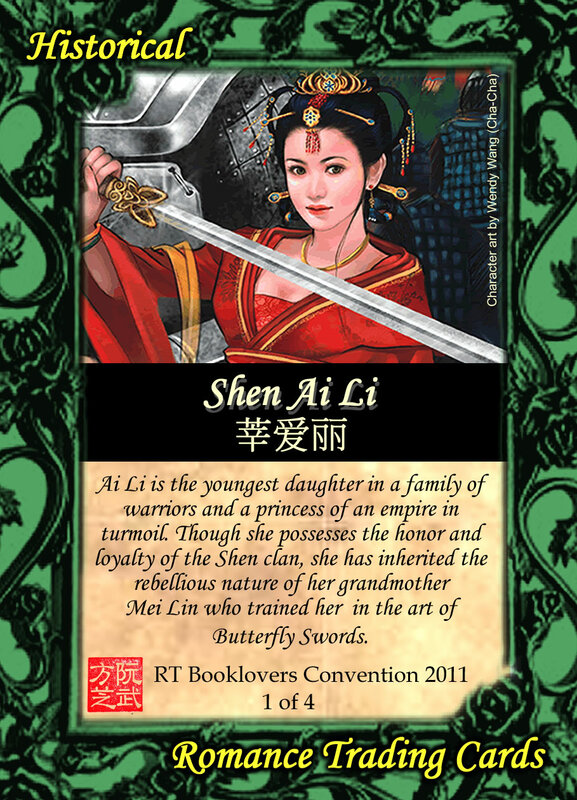 Today I’m talking to Jeannie Lin (author of Butterfly Swords and The Taming of Mei Lin) about a new marketing tool she’s using: Romance Trading Cards. Jeannie, thanks for agreeing to chat about this fun tool. You mentioned in your newsletter that there’s a “Community at Romancelandia.” Please excuse my romance-genre-ignorance. Is “Romancelandia” an actual community title or just a term, like “blogosphere.” If it is a place, where is it? Jeannie: Romancelandia is a term which incorporates the writers, publishers, agents, readers & bloggers of the romance community. I think the romance world is much more connected than other fiction genres. As a result, there actually is a “place”. It’s a combined sphere of the physical realm: booksignings, fan events, romance reader/writer conventions such as Romantic Times and RWA national conference. Then mix that all in with the blogosphere, Facebook, the Twitterverse. Soon it feels like everyone knows everybody. Victoria: Now, about the cards, were they invented as a fun way for authors to meet and greet at conferences or what?! It’s such a neat idea, but I’m curious about its beginnings. In less than five days, we created a pink RTC logo, authors Amanda Berry and Shawntelle Madison put up http://www.romancetradingcards.com , I ran and posted online tutorials, and more than a hundred authors had said they were IN. It was the collective excitement about it that got the whole thing rolling. The beauty of the idea is it’s so simple and cheap to join. It allows authors to be creative and provide a way for readers to get something special and collectible that’s unique to each book—and it all hinges on the strong sense of community within the romance genre. Victoria: What does it take to join the club? I’m assuming you need to have a published book, but what are the other rules? What information does each card need? Jeannie: There are no rules. 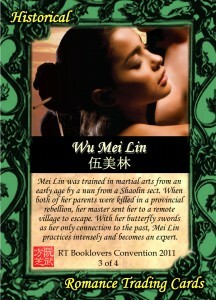 J The only requirement is that the author create and print the card and make them available to readers. The design is completely up to them. There are templates to provide people a starting point, but those are just suggestions. I think it’s wonderful to leave it completely open and I think that’s another reason why people are so excited about this. 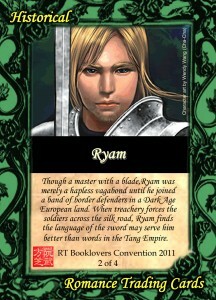 They can customize it and really make the cards reflect them, their books and their readers. Jeannie: Other people have thought the same. Everyone kept on asking me if they could still join. Some thought that after we hit 52 authors, no one else could come in. That’s not the case at all. There’s no reason why people can’t do playing cards if they wish. (See previous note about “No rules”) They can package cards together and give them away with gum. They can create a role-playing game around it in Pokemon/Yu-gi-oh style if they want. That’s why I refer to this as grassroots/guerilla marketing. It’s growing organically and the experience evolves based on all the people participating. Victoria: To your knowledge, are there other genres adopting either approach (trading or gaming cards)? Jeannie: I think the potential is there. I’m sure fantasy and paranormal authors have independently created these as promotions. All it takes is a little interest to get the ball rolling. Jeannie: Many of us are using GotPrint.com simply because we’d used them before for other promotional materials like bookmarks and postcards. The cost is relatively cheap. 100 cards will cost you about $17 and 1000 is only a bump up to about $25. That’s not including shipping. Where it can get more expensive is artwork and graphic design. Many authors are using stock images as well which can cost around $10-$20 each for nice ones. Some are hiring graphic designers to do the work, which makes sense because they’re job is to write and graphics programs can be time consuming. I designed and created my own, but I had previously commissioned character artwork for Butterfly Swords from an artist I liked on deviantArt.com. So in truth my Ai Li and Ryam cards are a bit expensive. But you really can be in for about $20 and create a great card with a little computer savvy (see the Tutorials page on http://www.romancetradingcards.com) and a really nice cover. Victoria: Thanks so much The whole concept has me stoked. Jeannie: I’m glad to hear you’re stoked. The excitement I’ve seen from authors and readers has been quite uplifting. It’s so good to see people gather around and get excited about something positive. The beauty of it is we’re really seeing how fast the Internet and a community can mobilize and I’m just thrilled to see something positive go viral. Okay, maybe not quite viral, but at least feverish! I hope it will be a great experience. I’ve kept quiet about some of this until I knew it would happen. Several months ago I discovered a favorite author of mine, Guy Gavriel Kay, has his next novel, “Under Heaven” coming out and it’s set in Alternative World Tang Dynasty China. Once I recovered from shock (he’s always stayed in Europe before) I contacted his press agent and was given the go ahead to receive a galley for review purposes. The reviews will go up in China History Forum Online’s newsletter, The Historical Novel Review site (where I currently have “Ransom” by David Malouf reviewed), The Ron Empire, my facebook account, She Writes, GoodReads and anywhere else I can think of to put it. It hasn’t arrived yet, but I feel like a bird of prey hovering over my mailbox. Check out this interview for excellent ideas on marketing yourself and your work. Writing the book is half the job!